Sprains and strains are common injuries which a first aider may encounter. 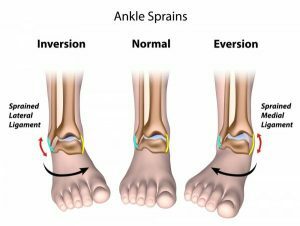 So what is the difference between a sprain and a strain? A sprain occurs when a ligament is torn at or near a joint. Ligaments are bands of tough tissue (known as connective tissue) which connect bones in a joint. Excessive force applied to a joint can cause these ligaments to tear – this is a sprain. A common injury encountered by first aiders is a sprained ankle. A strain is an injury to muscle. Strains occur when muscles are overstretched. This can cause the muscle to tear. Common muscles to be injured in this way are the hamstrings in the leg. This is a common sporting injury. Although there is a difference between sprains and strains the first aid treatment of both is the same. This simple first aid treatment will relieve swelling and subsequently relieve the pain from these injuries. It can be difficult to tell the difference between a sprain/strain and a fracture. Always seek medical advice if there are concerns that a fracture may be present. What are the causes of Hypothermia?